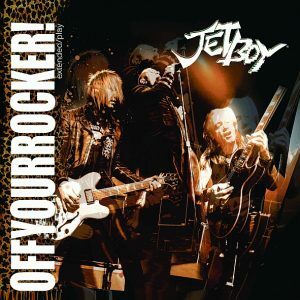 Sleaze rockers Jetboy will be releasing a new edition of their EP Off Your Rocker! entitled Off Your Rocker! – European Edition via City of Light Records on September 30, 2016. “Jetboy is an American San Francisco-based hard rock band founded in 1983 by guitarists Billy Rowe and Fernie Rod. Their 1988 debut album “Feel The Shake” peaked at 135 on The Billboard 200. After parting ways with original bass player Todd Crew in mid-1987, the band was joined by former Hanoi Rocks member Sami Yaffa. In August of 1987, Todd Crew died due to a drug overdose in the hotel room of Guns N’ Roses guitarist Slash. The second album “Damned Nation” was released in 1990. In the following years, Jetboy released some compilations & live-recordings also, among other things “A Day in the Glamourous Life” (1998), “Make Some Noise More” (1999), “One More For Rock ‘n’ Roll!” (2002) and “Now And Then” (2010). In this time, the band played tons of concerts and festivals with bands like Twisted Sister, Warrant, Ratt, Whitesnake, Scorpions, Cinderella, etc. As first “Off Your Rocker!” was to get as digital release only, the band produced a few copies for the shows. Now the Mini-Album will be released for the european fans via City Of Lights Records as “European Edition“. “Off Your Rocker! – European Edition” will also featuring the fantastic bonus track “Stolen People”. Jetboy‘s 2016 line-up consists of Mickey Finn (vocals), Billy Rowe (guitars), Fernie Rod (guitars), Charles Norman (bass) and Ron Tostenson (drums).